Technology services for smarter higher-ed projects. 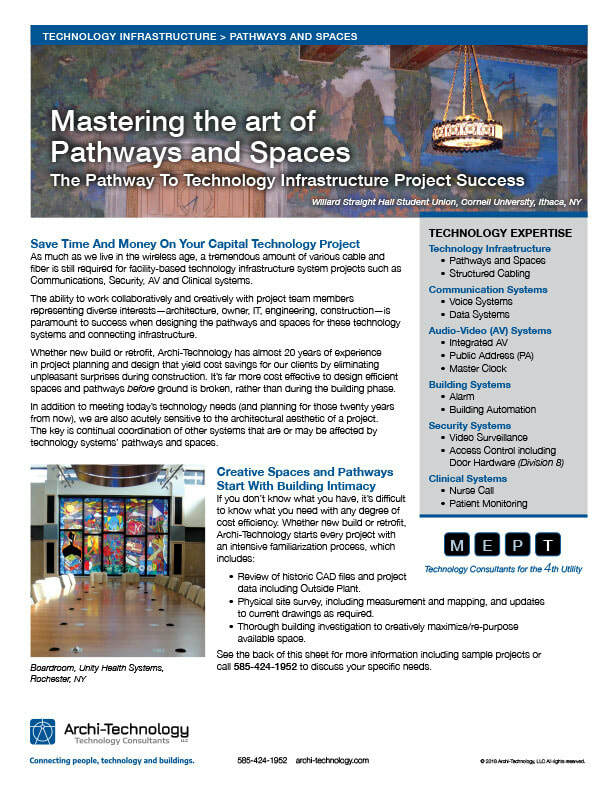 Technology planning, design, and documentation that add value to your facilities. ​in buildings and campuses throughout Western and Central New York State. Select upstate NY colleges and universities that rely on Archi-Technology to save time, optimize budgets and avoid pitfalls. Technology Conditions Surveys assess the conditions of technology systems in all or select district buildings. Comprehensive Technology Plans develop 10-year strategic roadmaps that optimize funding sources and prioritize projects based on district goals. Technology Design services for technology infrastructure and IP-connected systems such as Communications, AV, Instructional and Security using a Design-to-Manage approach. Systems Design and Implementation Standards provide a district-wide strategic framework for technology system design and installation that saves time and ensures quality. Technology Procurement and Selection services provide turnkey bid management including defining user needs, vendor selection and presentations, and recommendation reports. Technology Construction Management (TCM) services for Infrastructure, Communications, AV and Security systems that save time and expenses. Systems Documentation provides an accurate visual database of your current technology systems using Electronic Facility Records (EFR). Technology T-Series Drawings are used by NYS school districts to reduce service call times, improve planning efforts and improve facility operations. Archi-Technology provides direct, onsite services to NYS colleges and universities and their Architects in Central and Western New York State. Select the map to see a detailed view of our service delivery area. ​Districts in eastern NYS can use our network of credentialed professionals who are certified by Archi-Technology to provide our proven technology services. Valuable resources for your current or next technology project. Discover a wealth of free planning resources to help you take control of your organization's technology initiatives from planning and programming through design, construction and management. Visit our Resources section. ​Keeping technology invisible in historic buildings. While historic buildings provide college campuses with a direct connection to the past, they still need to function as modern buildings including ubiquitous access to streaming data. Learn how to make technology infrastructure design invisible to the eye in historic building renovations. View PDF. Free resources for your current or next higher-ed technology project.